The global hub for conversation around health, well-being and performance. Thrive Global is here to change that. You can read Arianna’s letter introducing the company and its three interconnected components here. I’m thrilled to introduce you to one of those elements, The Thrive Journal — our media platform that we hope will become the global hub for conversation around health, well-being and performance. But we want to do more than inform, entertain and raise awareness about the desire to live more productive, more fulfilled and happier lives. Our goal, as a behavior-change platform, is to help you — our community — go from knowing what to do to actually doing it. As you’ll read this week in “The United States of Burnout” and “The People’s Republic of Burnout,” the stress and burnout epidemic is global. That’s why Thrive Global’s approach to addressing it is, as our name states, global. The Thrive Journal will feature original editorial content, video series, the latest science, expert commentary and community contributions. We’ll be working with world-renowned experts in the fields of neuroscience, psychology, nutrition, sports, productivity, sleep and more to address the root causes of stress and burnout, and to offer action-based solutions to our community. An emphasis on action: As you explore Thrive Global, you’ll notice a highlighted tip at the end of every article. These are called microsteps, and they’re the foundation of our behavior-change platform. Microsteps are small actions and pieces of inspiration that can be incorporated into your life right away. So everything you read on Thrive Global — from stories on productivity and our relationship with technology to pieces on spirituality and sleep — ties back to small changes that are easily integrated in your daily life. A core focus: You’ll see a wide range of contributors in The Thrive Journal from business leaders, athletes, celebrities and politicians to experts, academics, scientists and religious leaders. While their stories and our scope of coverage may seem vast, there’s one unifying thread tying everything together: well-being and productivity. New role models: One of the most important aspects of this culture shift is going to be introducing new role models. To move from a culture of “I’ll sleep when I’m dead” to one in which prioritizing your health and well-being is seen, rightly, as a sign of strength, discipline and dedication, we need leaders in every field to be modeling these habits and speaking openly about them. Take a minute to see why Amazon CEO Jeff Bezos prioritizes sleep, how Seattle Seahawks quarterback Russell Wilson optimizes his day, and why Jimmy Iovine and Liberty Ross power down their cell phones for the night at dinner time. Deep partnerships: As a company focused on productivity, we’re committed to making sure that the time you spend with Thrive Global is well spent. We’re excited to be partnering with industry leaders in video, audio, social media and more to make sure that Thrive Global is giving you quality experiences across all platforms. We’ve teamed up with VICE to introduce a video series called “The Long Game,” focused on elite athletes and their strategies for top performance. The premiere episode features NBA all-star Andre Iguodala of the Golden State Warriors who talks about his meditation practice, his morning routine and more. Be sure to watch it here. We’ve partnered with VICE’s new health site, Tonic, to produce a mental health index for college campuses in the spring of 2017. Both VICE and Thrive Global share a deep commitment to covering mental health on our platforms, and we believe in the importance of putting the spotlight on educational institutions where millions of young people spend formative years. We’ve also partnered with Tonic to convene a global series of dinners with the nonprofit organization Death Over Dinner that encourages meaningful dialogue around life’s big questions, including death. Since its founding in 2013, the interactive “Let’s Have Dinner and Talk About Death” platform has been used to host more than 100,000 dinners. Death Over Dinner founder Michael Hebb calls the conversation around how we want to die “the most important and costly conversation America isn’t having.” You can read Michael’s piece on our partnership here, and learn how to host a dinner here. 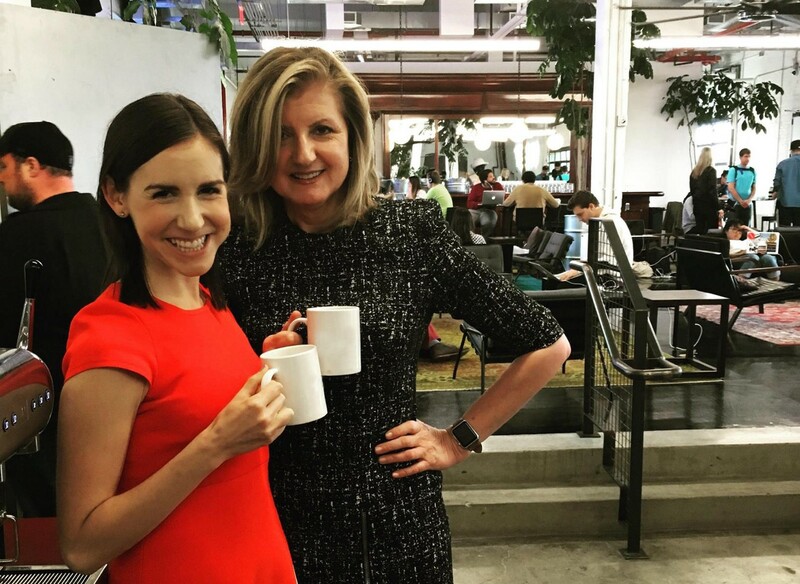 We’ve joined forces with millennial news brand NowThis on a moving video series called Turning Points, featuring millennial women who burned out and decided to pursue a different path to success. Read more about why this series is so meaningful to us here, and watch the trailer here. We’ve teamed up with iHeartMedia to launch “The Thrive Global Podcast,” a bi-weekly series featuring Arianna in conversation with notable leaders, celebrities, athletes, academics, scientists and more about how they thrive. As Arianna says in our preview episode, our goal is for this podcast to be a place where people can be “inspired, informed and recharged.” You can download the preview episode here and join the conversation by using #thrivepodcast on social media. Be on the lookout for the series debut in January 2017. We’ve joined forces with Audible to create Goodnight Smartphone, a parody — written and narrated by Arianna — of the universally loved children’s book that encourages you to put your smartphone to bed (outside the bedroom, of course!) before putting yourself to bed. The story is available as a free download exclusively at Audible this January and can be preordered now here. We’ve partnered with The New York Times’s T Brand Studio on high-impact native advertising programs — starting with a robust, full-year series with Quaker Oats that aims to make your mornings more productive. We’ll be kicking off our interactive series of infographics, videos and features in early 2017. A distributed platform, community-first approach: You’ll find Thrive Global on the platforms you use every day ranging from Facebook, Twitter, Instagram, Snapchat and LinkedIn to Pinterest, Spotify, YouTube, Reddit and Quora. We’re also thrilled to be publishing on Medium, a social content platform, which will be home to original and curated stories from Thrive’s editorial staff, along with pieces from contributors and partners. Medium makes it easy not only to respond to others’ posts, but also to become a contributor yourself. We hope you’ll join the Thrive Global community and the conversation on these platforms and create a Thrive Global account by logging in with Facebook or email here. We can’t wait to hear from you.